If you’ve been listening to Nancy DeMoss Wolgemuth’s teaching on Revive Our Hearts for any length of time, you’ve probably wished you could peek behind the scenes into her personal life! That’s why I love this conversation between Nancy and Betsy Gómez, who got the chance to sit down with Nancy and ask her some tough questions! Download the radio program, and then bounce over to Betsy’s Instagram page. This week, she posted a precious video revealing the gender of her baby! Congratulations, Gómez family! You’ve heard of FOMO—the fear of missing out—but have you heard of FOMOOGW? Okay, so that’s not a real acronym, but it is the topic of Lore Ferguson Wilbert’s latest blog post. Lore says, “Because we live in a time when there is a message, sermon, book, meme, or quip for everything, we can have a fear of missing out on the pivotal truth we believe will really change us or set us free.” She says that “we don’t have to approach [God’s Word] with a fear of missing out because the words within it are always useful for life and godliness. So today, camp out on one truth from God. Just one.” Great advice! Where do you fall in your family’s line-up? Even if you grew up as the youngest child among your siblings, you’re certainly not the youngest in the family of God. “One of the unforeseen blessings and challenges of my life,” writes Abigail Dodds, “has been the gift of being an older sister in the Lord to other women. 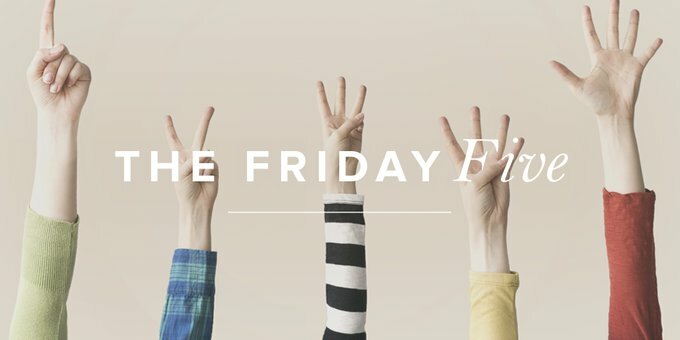 I’ve had to learn to be quiet and ask good questions and help others come to the right answer on their own. . . . Having younger sisters in the Lord is one of the sweetest, most joyful gifts I never saw coming.” In this post, Abigail shares the blessings—and the difficulties—of being an older sister in Christ. Contrary to popular opinion, Kevin DeYoung says we are supposed to feel bad about stuff. “Shame can be a hard subject to talk about because a massive problem for many people is misplaced shamed. Whether in everyday ‘failures’ like a messy house and unwanted pounds, or in more catastrophic situations like the experience of sexual abuse or racial bigotry, almost all of us have elements of our person or our past that wrongly make us feel embarrassed, dirty, and ashamed.” DeYoung shares what Scripture has to say about shame—and praise God, it’s good news! “I can tell you anything. No one understands me like you do.” “I don’t know what I would do without you.” “I’m so glad we struggle with the same sins. It makes me know that I’m not alone.” Do these statements sound familiar? “Codependency stems from an epidemic—a crisis that has quietly crept into our churches. Rosaria Butterfield calls it the ‘crisis of loneliness,’” a topic she discusses in this fantastic interview with Monica Geyen. Her book, The Gospel Comes with a House Key, is one of my favorite books of 2018—and her interview reminds me of an upcoming book that I predict will be a favorite of 2019! Friend-ish: Reclaiming Real Friendship in a Culture of Confusion by True Woman blogger Kelly Needham is available for preorder now! Listings here do not imply endorsement of all writings and positions of the individuals mentioned.